Model 811 Series High Quality Aviators Desk Clock. Limited supply available. 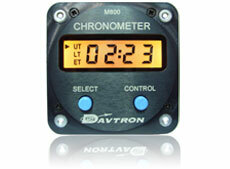 40 years ago, Davtron designed and manufactured our 811 series clock for aircrafts. This 811 series clock was installed in Air Force One aircrafts SAM 26000 and SAM 27000. 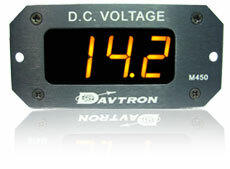 Davtron clocks have been installed on all Air Force One planes since 1974. With over 40,000 811 clocks in the field, the 811 series remains in production today. We are offering a desk version of this historic clock to proudly display in your home or office. With this clock's long esteemed history, it will surely be a topic of conversation for those not necessarily sitting in your cockpit. The digital O.A.T. replaces one of the most difficult instruments to read in the cockpit, and it is particularly helpful for night or IFR flying. Features include: minimum panel space...lightweight...automatic dimming...digital temperature probe (miniature remote probe). Check out the “Narrow Product Search” page, this will allow you to select specific features and installation sizes. Products will display immediately on your selections. 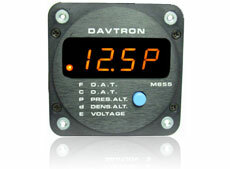 Small and lightweight, Davtron's Model 450 provides more accurate information about your electrical system. Know the exact amount of voltage at which the battery is being charged. Prevent excessive water loss and battery failure. The unit will display the amount of capacity remaining in the battery. Check out the "Narrow Product Search" page, this will allow you to select specific features and installation sizes. Products will display immediately on your selections. A series of computer based products that bring digital information to the pilot at the push of a button. 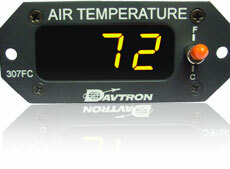 The Model 655 is a multi-function gauge that displays aircraft voltage, outside air temperature, pressure altitude, and computes density altitude for the pilot. Take-off roll length, maximum rate of climb, and fuel consumption can be determined from density atlitude and the aircraft's flight manual. Check out the “Narrow Product Search” page, this will allow you to select specific features and installation sizes. Products will display immediately on your selections. Our various clocks and multi-functional chronometers are designed to work under the most stringent operating conditions. 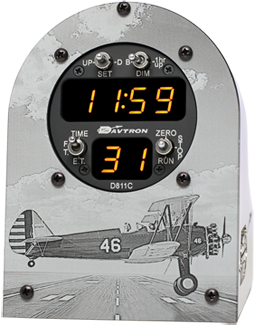 All of Davtron's new clocks are a two button design that make the pilot's job easier. These clocks display universal time, local time, and elasped time. The advanced clocks add a flight time channel to use for fuel timing. There are two different types of displays available, liquid cyrstal or incandecent; both are readable in high sunlight situations. Check out the “Narrow Product Search” page, this will allow you to select specific features and installation sizes. Products will display immediately on your selections. A computer based product that brings Digital VOR information to the pilot at the push of a button. The unit displays the radial position of the aircraft, both to or from the VOR station. The radial readout is the actual one the aircraft is on and is updated every 0.8 seconds. 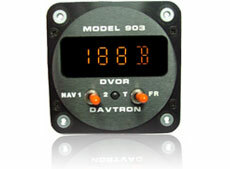 The display makes VOR step down fixes and intersections easily read with a quick glance by the pilot. The pilot can see how fast they are approching the fixes rather than having the needle on the OBI hard over to one side. One model of the 903 comes with a channel that sequentially displays the Morse Code indentifier of each VOR station or localizer. Check out the “Narrow Product Search” page, this will allow you to select specific features and installation sizes. Products will display immediately on your selections.